Posted on Thursday, November 24th, 2011 at 10:25 am. This is a story about Thanksgiving traditions and my hidden talent. (More on the talent later.) Those of us who can’t trace our ancestry to the Mayflower are left to create our own Thanksgiving traditions. As a result, I think I had the best Thanksgivings of anyone I know. To understand, we have to start at the beginning– 1965, when my parents came from Taiwan as chemistry graduate students. They left the heat and humidity of Taipei for very unfamiliar surroundings in Providence, Rhode Island, and had their first Thanksgiving that year. They learned to drive cars, leaf-peep, and appreciate college basketball games. For all of their embrace of American culture, they were homesick, so much so that anyone with a vaguely Asian appearing face was fair game to them as a new friend (“Are you Chinese?”). While their new home was very alien to them, at least they were in authentic surroundings for Thanksgiving– Pilgrim territory. They learned to eat turkey (but still do not understand the appeal of the usually dry bird) and the usual accompaniments. They also learned that Thanksgiving is about welcoming family, friends, and perhaps lonely and displaced strangers to the table. What made this holiday so special in our house was the ever-changing, motley international crew my family hosted each year. My parents were scientists at a national research laboratory. Their institution attracted scientists from around the world, who would come to work alongside their American-based (if not American-born) colleagues for any time from weeks, to months or even years. This is the motley crew who would round out the crowd at our Thanksgiving table. The turkey took its rightful place as the centerpiece of the meal, complete with the ritual carving done by my father with an electric knife given to my parents on their wedding in 1967. The same knife is still being used to this day for this purpose, just once a year. While we served the turkey, we did not love it. Taiwanese cuisine has no place for such a big bird, and Taiwanese homes are rarely equipped with ovens. Still, it was understood that Thanksgiving required a turkey, so there it was. Ours was basted with a soy sauce marinade but otherwise resembled the turkeys “everyone else” had. This is where the similarities ended. Surrounding the turkey on the table would be stir-fried greens and several other Taiwanese dishes that my parents actually enjoyed eating, unlike the turkey. We’d have two types of stuffing: an American bread-based version, and a Taiwanese version, made of sticky rice, shitake mushrooms and Chinese sausage. That was my family’s contribution. The fun really began with the various pot luck offerings our international guests would bring to share. It wasn’t necessarily food of their own culture, but it was never American, either. For example, I remember the deep-fried, but somehow light, Swedish rosettes brought by Rose, who hailed from Manila but was married to a Swede. The first samosas I tasted came from Sakura, who herself had learned how to make them from an Indian visitor in Tokyo. Srinual, a native of Bangkok, made a vinegary antipasto. We’d sit around the table or wherever there was space, and share food and stories. All in English, the universal language, but in a wild variety of accents. Most of the time people understood one another, or at least, enough. The nights would be filled with fascinating tales of far-away lands, and lots of laughter. This is where my hidden talent became important. You see, I can understand foreign-accented English, from almost any origin. I do not mean this in any disparaging way. I am proud of this skill, because it is extremely useful. I am the person who ends the discomfort that arises when two people, ostensibly speaking the same language, ask each other to repeat what the other said over and over, gaining no more clarity each time. I “translate.” My talent may not be as impressive as being fluent in several foreign languages, but I think it’s possibly even more helpful. Since Esperanto never really took off, most of the world has given in to learning English to speak to one another, with variable success. Getting our now expanded family together for Thanksgiving now is more difficult, as we are now scattered between Taiwan, where my parents have returned, San Francisco, and Connecticut (Pilgrim territory again). But when we do get together, we would make a pretty good UN delegation on our own, representing the United States, Taiwan, Trinidad, China and Korea. And while our accents may range from Chinglish to Korean to Trinidadian to “I don’t have an accent” and even a bit of Long Islandese and California girl thrown into the mix, fear not. Remember, I can understand anyone’s English. I’ll translate. This is the stuffing that graces the Thanksgiving tables of many Taiwanese American families, including my own. 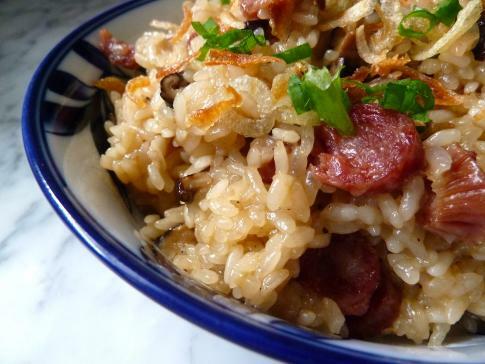 Besides the toothsomeness of the sticky rice, it has the richness of mushrooms and chestnuts, the fragrance of rice wine, and the slightly sweet succulence of the Chinese sausage. The fried shallot garnish adds flavor and crunch, much like the fried onions on that other Thanksgiving staple, the green bean casserole. You can eat this rice stuffing on its own, but it is truly amazing when it’s been cooked in the turkey. Special note: this rice needs to be soaked for several hours or even overnight, so prepare in advance. Makes about 8 cups, enough to stuff a medium sized turkey, and then some. 1. Soak rice in cold water, about an inch more than enough to cover. Allow to soak for at least six hours or overnight. 2. While rice is soaking, soak mushrooms in a separate bowl in very warm water for at least half and hour. When softened, remove stems and coarsely chop. 4. Drain soaked rice in a sieve and rinse with cold water. 5. Heat oil in a large, heavy pan or stock pot and stir fry garlic and ginger for several minutes. 6. Add diced sausage and cook for a few minutes. 7. Add drained and rinsed rice, stir and fry for a few minutes. 9. Add wine, broth, and all seasonings and bring to a boil. Adjust seasonings to taste (may need more soy sauce or some salt). Make sure to stir periodically because sticky rice is, well, sticky. 10. Add chopped chestnuts and gently stir into the rice mixture. 11. Lower heat to a simmer, cover pot and allow to steam, undisturbed for 20 minutes. Resist the temptation to peek under the lid. 12. At this point, rice should be fully cooked and can be used to stuff the turkey. If it seems too dry stir in more broth until moistened. 13. If preparing to eat without stuffing in turkey, stir contents and then replace lid. Remove from heat and allow to sit for 10 minutes before serving. 14. Garnish with scallions and fried shallots, if desired. Excellent with turkey gravy. Linda Shiue is a doctor and food writer who believes in the healing power of chicken soup. You can read about more of her travel misadventures at spiceboxtravels.com and follow her on Twitter @spiceboxtravels. Her work has appeared in Salon, The Asia Magazine, and The New York Times. A version of this article was published on November 15, 2010 on Salon.com. LOVE this! Sticky rice was our thanksgiving side of choice too!